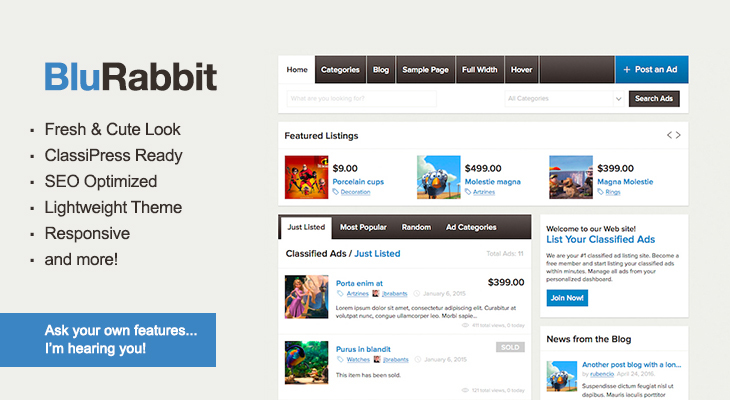 Being released in February 2011, “cutest” it is the childtheme for ClassiPress with more sales around the web. 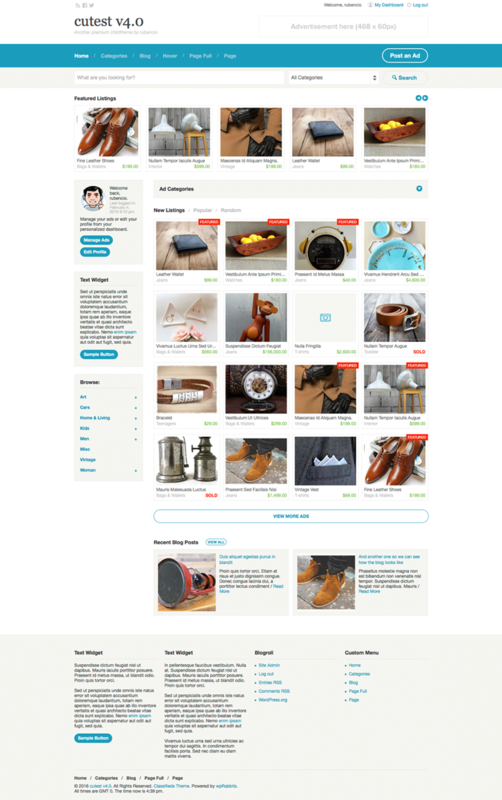 This childtheme is based on the original popular crafting website “Etsy”. 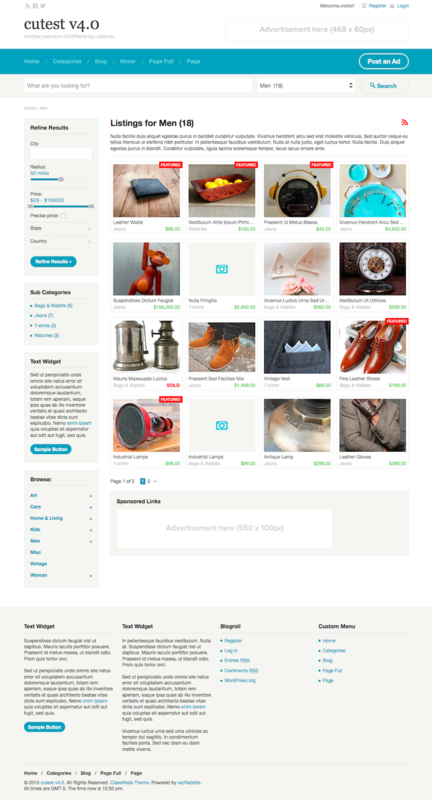 Just like Etsy, this theme is perfect for your marketplace where artisans can showcase and sell their products (other topics can be covered also). 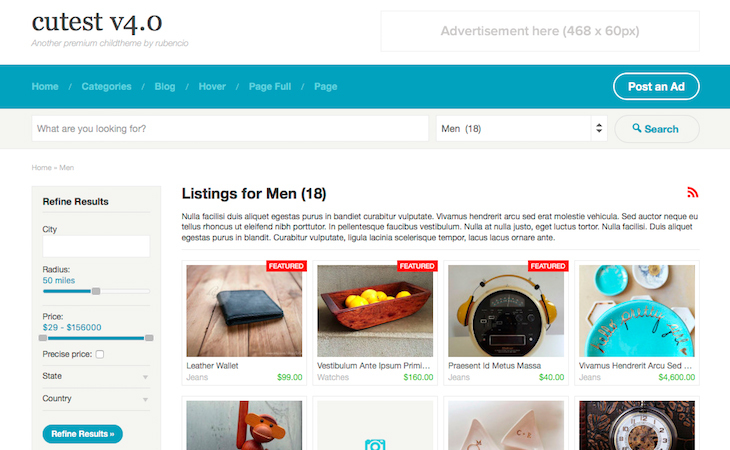 The theme uses a grid instead of a list for showing classified ads. Now featured ads have a ribbon in red color so are more visible, giving them the relevance needed. You just need to download the childtheme, upload it to your themes folder, activate it and set the sidebars or rearrange them in order to suit your needs… as simple as that! – Fresh, cute look and feel. 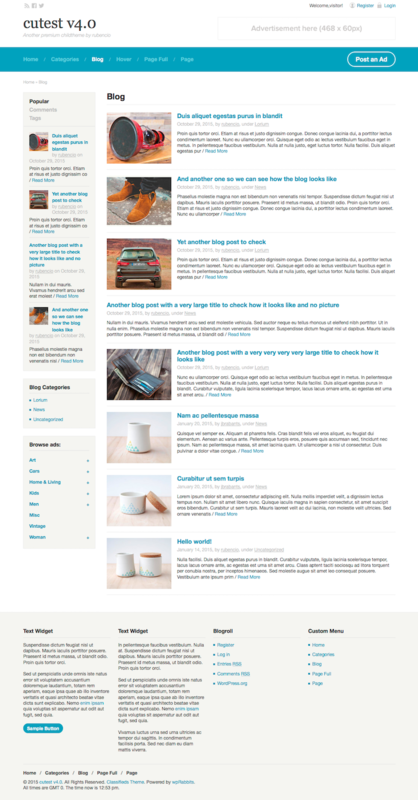 – Latest blog posts integrated in home. – Improved WordPress custom menus to better handle categories/subcategories on widgetized sidebars. – Bigger map under Ad details pages. 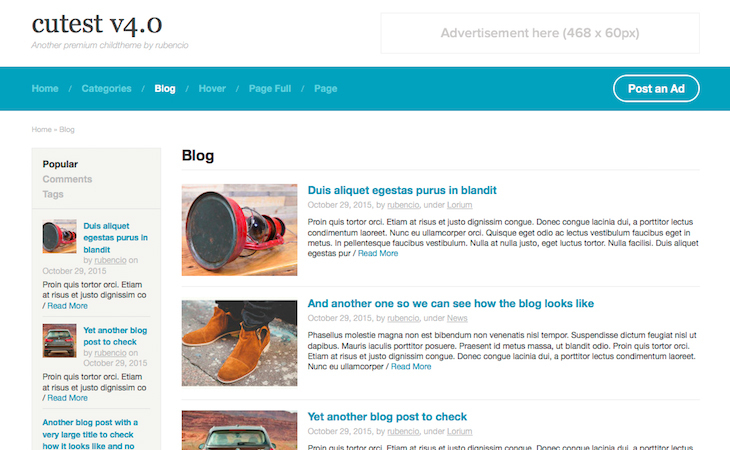 v1.0 – February 22nd, 2011. Initial release. 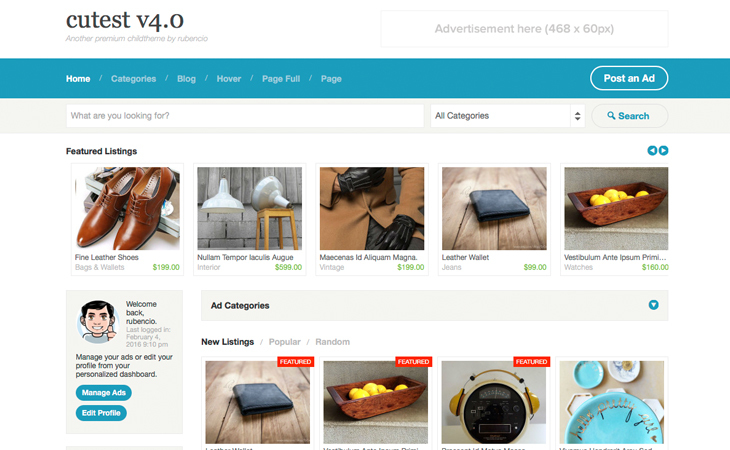 v2.0 – August 6th, 2012. Bugs fixed. v3.0 – February 22nd, 2013. Major update. v3.1 – November 26th, 2013. Bugs fixed. v3.4 – March 20th, 2015. Major update. v4.0 – October 16th, 2015. Major update. 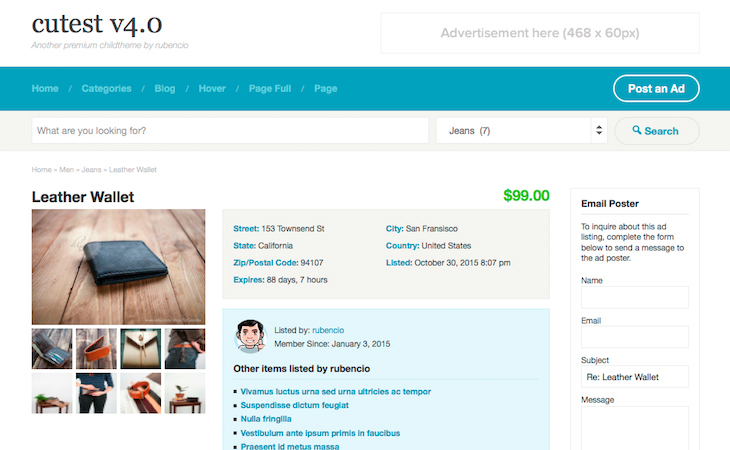 v4.1 – November 1st, 2015. Bugs fixed. v4.1.1 – November 23rd, 2015. Bugs fixed. v4.2 – March 30th, 2016. ClassiPress 3.5.4 compatible. I have worked on many child themes for classipress and this is by far the best! Thanks a lot for such a great words. but the long time. 19 days ago i don’t see any support my question. so why you delete my question. this the bad support system. my question live to 19day ago. it don’t have any support. Hi Masuna, your previous comment simply went to spam… I’ve just recovered it. Concerning the lack of support I have personal situation (new kid) so the support it is getting delayed in some tickets seems not urgent. Sorry! I’ll be replying you asap but this is not the way to handle the situation since looks like you are spamming this “Comments” section. Best regards! So thank you for reply. But i don’t like and don’t know for my question. I have comments many many on maketplace., It not go to spam comments. Thanks for your nice words!!!! Sorry, as you can see in demo site there are no “related ads” however there are some tutorials you can follow to have this done or you can pay for this feature as a custom development. Sorry the delay… taking care of your ticket now. Comprei seu tema, como faço para colocar anúncios relacionados? Pode me passar o código? Please look for some tutorials on AppThemes Forum or install a plugin to achieve this. Seu tema funciona bem com o plugin vendido em seu site Post Sort plugin for ClassiPress? What plugin are you referring to? Do you mind to provide an URL? In that case you better don’t think on that as a solution since it is not compatible with latest Classipress version. Hi. I will buy this child-theme, but i dont how can i install it. I have already these in support forum too. Below is the link. You can follow the install instructions on product page. Please check this video explaining how to install a WordPress theme. I would like to buy the child theme and wanted to know if you can increase the image size. What happens when you increase the images size. Now there is 5 pictures in a row, can they be changed to 4 pictures in a row with size increase? I don’t get what you mean. Where do you see 5 pictures in a row? Sorry my mistake. The featured listings slider was the one to show 5 images side to side. The ads that are listed in the new listings shows 4 images side by side. Can I increase the size of these images? They are 17×135 at the moment. Can these image sizes be increased to 250 or larger. Can I change image to 3 images shown horizontally instead of the 4 ? Sorry, unfortunately there is no option to change the size of the pictures. 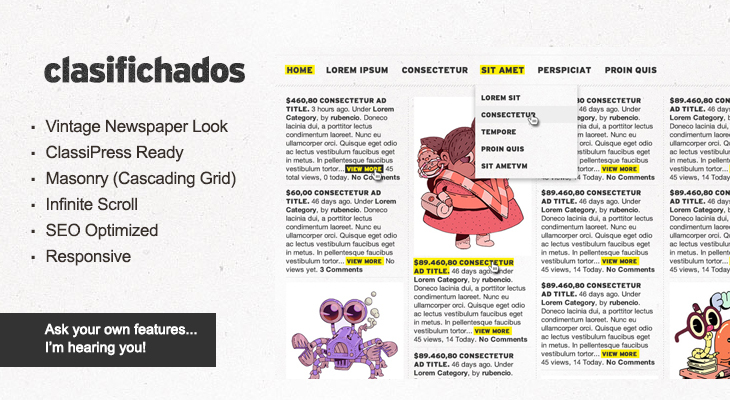 In case you want to do that you´ll need to tweak some functions and also the stylesheet. 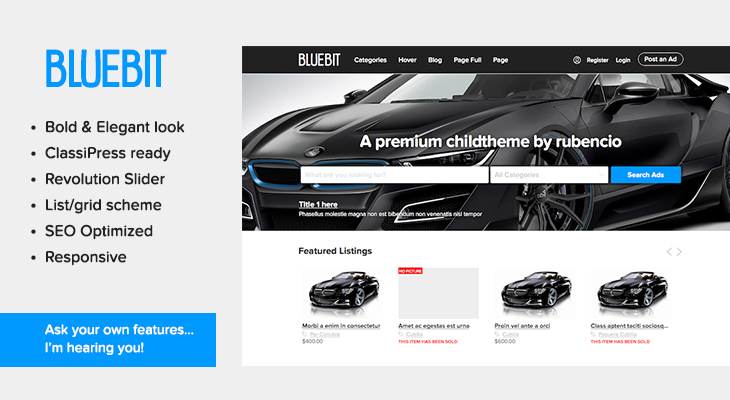 Yes, the childtheme it is responsive. Can this plugin be used with the dynamic-multi-level fields for classipress ? No me deja instar, me dice “No encontramos el tema principal. Por favor, instala el tema principal “classipress”. pero yo tengo el classipress instalado. Sigues teniendo este problema? Por casualidad has renombrado la carpeta original del tema ClassiPress? No tengo referencias anteriores de clientes teniendo este problema en una instalación limpia de ClassiPress así que me resulta un tanto extraño. SI SI ya lo arregle. I want to remove the google map from being displayed in the ad. How to go about it ?